On January 24, 2019 at about 7:30 pm, an eastbound bus on Route 80 in Parsippany, New Jersey struck the highway median, went airborne and then crashed into three cars. Tragically, this accident killed one person and injured thirty-six. The cause of this horrible accident is still being investigated. This headline and the terrible specifics of this bus accident seem familiar because we seem to hear about incidents such as this in the local news all the time. In the Garden State, statistics show that buses are nearly three times more likely to be involved in a large vehicle accident than the national average. This is probably a result of the many commuters who ride buses to Newark, Philadelphia and New York City for work or pleasure each day. This also means we have more buses on our roads than most others states within the country. Every day, thousands of New Jersey residents take buses to school, their job or to get wherever they want or need to travel. For some, this is their only way to travel within their community. Unfortunately, this makes bus accidents in New Jersey unavoidable and scores of people are injured and killed each year in our state. Getting hurt in an accident with a bus usually has both short and long-term results. There can be medical and hospital costs, pain and suffering and you may miss time from work. Catastrophic or serious injuries can have more permanent consequences including long-term pain and disabling injuries. Passengers are not typically at fault in a bus accident and are likely able to collect damages for their injuries. Bus accident victims usually need medical treatment. Figuring out which insurance company will foot these expenses is not always so easy. Some bus operators need to have insurance covering doctors’ bills for passengers while others are not. 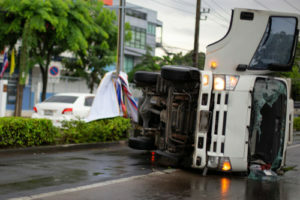 An experienced bus accident attorney can sort this out so these bills are paid. Remember, insurance companies want to make money and not pay it to accident victims. The less that is paid out, the more the insurance company keeps. A good lawyer will know how to bargain with the insurance carrier for you. He or she will protect you and battle for as much compensation as he or she is able to receive on your behalf. Who is to Blame for a NJ Bus Accident? Did you or a loved one sustain serious injuries due to a bus accident in NJ? Don’t let the medical bills pile up while you wait for the negligent party or their insurance company to do the right thing. Right now, you need an aggressive personal injury attorney on your side, fighting to get you the compensation you need, want, and deserve. The skilled attorneys at Blume Forte Fried Zerres & Molinari represent clients injured because of a bus crash in Union City, Bayonne, North Bergen, Chatham and throughout New Jersey. Call 973-635-5400 or email us to schedule a free consultation about your case. We have an office conveniently located at One Main Street Chatham, NJ 07928, as well as offices in Jersey City, Sea Girt and North Bergen.